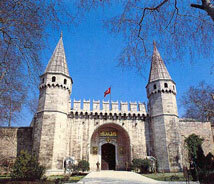 Following the conquest of Istanbul, between 1459 and 1465, Mehmet II built the Topkapi Palace as his principal residence and seat of government. The site is like a separate town with its own fortifications. Inside, among courtyards, gardens, pools and fountains there are both public and private buildings, chambers, kiosks and pavilions. Some of the collections housed at the museum include Ceramics, Glass, Silverware, Imperial Costumes, Arms and Armor, Miniatures and Manuscripts and Clocks. The famous Treasury contains one of the the richest collections of treasures in the world. Many gold and silver objects are displayed, most are embellished with precious stones. Don't miss the 86-carat spoonmakers diamond and the Kanjar, 14 inch emerald encrusted dagger. The famous movie Topkapi starring Melina Mercouri and Peter Ustinov was filmed in here in 1964.